Irises are most often grown from a rhizome, sometimes referred to as a bulb. Unlike bulbs, rhizomes are actually part of the plant root that is used to propagate new plants. 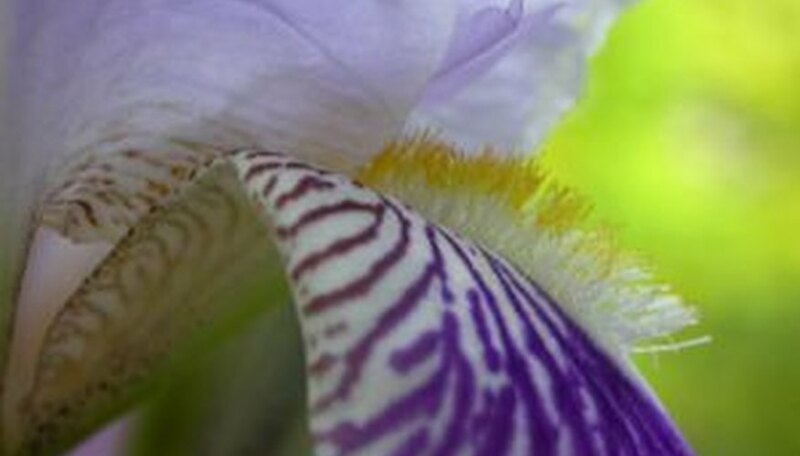 There are many varieties of iris, ranging from 8-inch tall dwarf irises to tall and colorful bearded irises. Plant large varieties in the back of garden beds with smaller flowers in the front. Plant dwarf irises in small clusters to accentuate their bright colors. Choose an area in your garden with partial to full sun and good drainage to avoid rhizome rot. Soak the area with water until puddles form. If it drains within 4 to 5 hours it is fine; otherwise work in enough compost to raise the bed 3 to 5 inches. Plant iris rhizomes so the root end is on the bottom, covering with soil until just the top is exposed. Space rhizomes 12 to 24 inches apart for large varieties and 8 to 15 inches apart for dwarf iris. Keep the soil around the newly planted irises moist but not soggy. Water deeply once to twice per week, depending on natural rainfall. Fertilize with bonemeal in early spring and again one month after blooming to encourage healthy growth. Divide iris clumps every 3 to 4 years to keep existing plants healthy and avoid crowding. Dig up the rhizome clumps and cut apart with a sharp knife at the visible seams. Replant the largest and healthiest-looking rhizomes. Divide after the last frost or six weeks after the last bloom. Plant irises from July to September to give them time to become established before winter. Weed the iris beds regularly and keep soil from covering the top of the rhizomes for lushest growth. Cut spent flower stalks close to the ground to encourage healthy growth. Avoid overwatering. After the first year iris rarely need additional water unless in extremely dry climates.